For Krampus Night, we will need a Kramp load of naughty “decorations” for this charitable and festive event. So we are buying all sorts of cheap thrift store Kristmas Krap, dollar store holiday shtuff, Halloween leftovers, glitter glue and a variety of art supplies create Krampus holiday-ish decorations! We need naughty peeps who like to play with scissors, markers, kid paint and glitter glue! 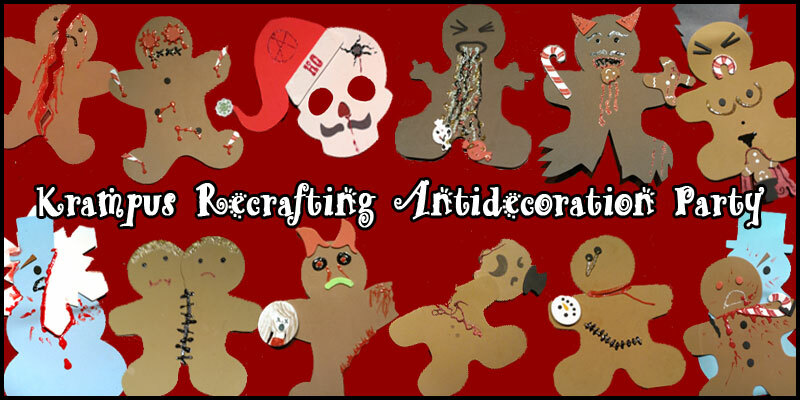 We will be making disturbing gingerbread people, candycane crossbones, skullflakes and whatever your little disturbed head comes up with. We will also be reimagining thrift/dollar store stuff into new Kramptastic awesomeness! Swanky holiday music, pizza and candy provided…as well as all the supplies needed. However, we also welcome you to bring your own crafting supplies, old holiday decor and ideas! Please note that this is for Krampus Night decor only and none of these will be for sale. This will be a fun night with others sitting at table making naughty holiday trimmings…just like naughty kids again! See you there and Merry Krampus!! !